Nowadays having confirmed CERADROP expertise on providing Advanced CeraPrinter equipment with Inkjet technology for functional devices manufacturing worldwide, we are proud to strengthen our collaboration with IMB-CNM and their choice of our Turnkey CeraPrinter X-Serie! 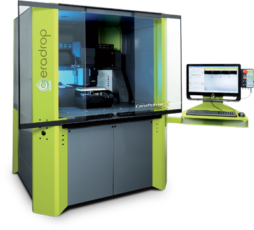 The Barcelona Microelectronics Institute works on exciting projects in the fields of micro and nanotechnologies and we are very much pleased to provide the actors with one of the CeraPrinter Series Models. The system provides numerous advantages for the users with its special configuration for dedicated applications, multi-material jetting capability, and of course, the possibility to fully accomplish the process.